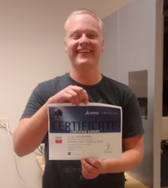 Nick Johnson, the TSA Vice President at Cherokee Trail High School sat for and passed the Certified SolidWorks Expert (CSWE) exam! The CSWE is the highest certification that Solidworks offers and is “ traditionally the go-to SolidWorks user” in an engineering firm. To put this accomplishment into perspective, Solidworks has confirmed that Nick is the one of only a dozen people worldwide to earn a CSWE, while in high school (one of that number was Chris Dosen, a former CTHS student and TSA State Officer). In order to be eligible to take the CSWE, Nick had to take and pass 6 other industry certification tests from Solidworks. According to Solidworks, Nick is the 1,895th person in the world to earn this certification and only 2.4% of users that earn a Solidworks certification progress far enough to earn a CSWE. Next Next post: TSA Fall Leadership Conference a big success!